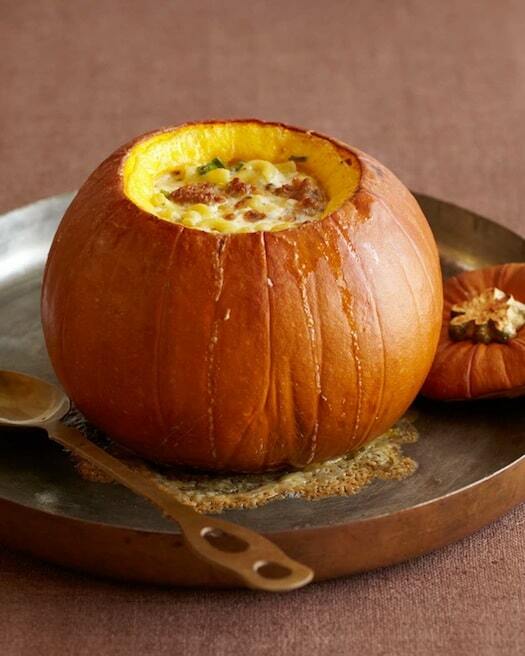 I give you baked macaroni and cheese, in a pumpkin. Crazy easy, crazy impressive! Thanksgiving is in a few days. Right now, households all over the country are practicing two should-be Olympic sports: the mad dash to the grocery store, and the clearing of space in your fridge for an enormous frozen bird (while still trying to fit all the other ingredients you’ll need for the big day). 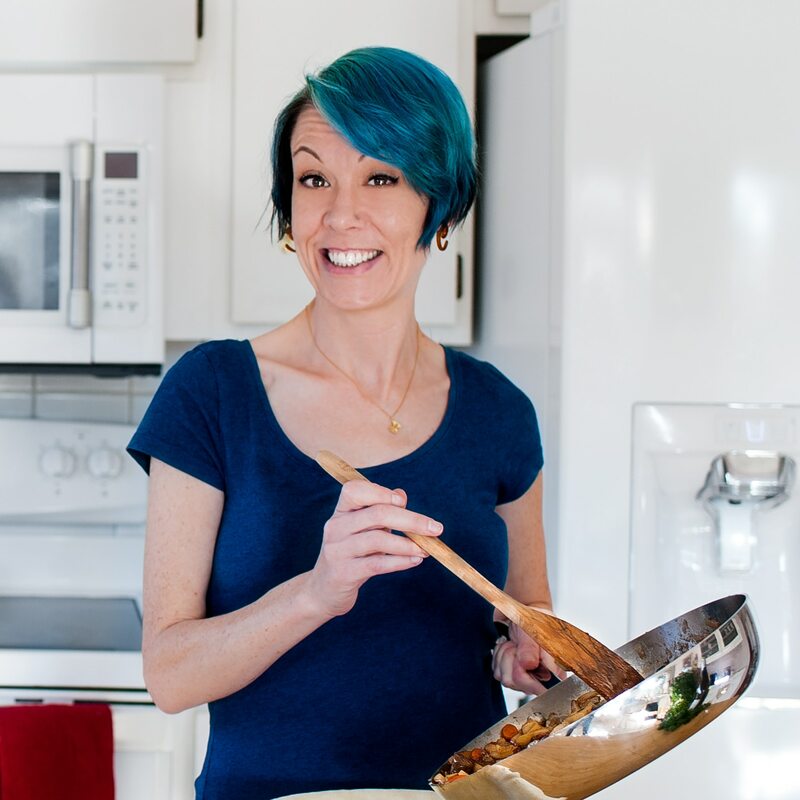 The idea of adding one more dish to your holiday menu may seem ridiculous, but hold on – I want to share something really special with you. One sentence: a lusciously melty homemade macaroni and cheese gratin, baked in a sugar pumpkin with rosemary, sage, thyme, and Italian sausage. This baked macaroni and cheese recipe was made for your Thanksgiving table – it takes very little actual work. Seriously, this is one of the easiest dishes in the book. You literally scrape out a pumpkin, pre-bake it, stir in some herbs, shredded cheese, cooked pasta, crumbled sausage, and finish in the oven to melt everything together. That’s it. You can even prepare the macaroni part the day before – just shred your cheese, cook your pasta and sausage, then combine and stash in a sealed container in the refrigerator. A few hours before showtime, pre-bake your pumpkin, drop in the macaroni, and finish the dish in the oven while the turkey is resting. Voila! Epic Thanksgiving side dish recipe. And then there’s the visual splendor of this dish, which is unlike any other. When it comes to baked macaroni and cheese dishes, you’re not going to find a presentation more impressive than this. Imagine the looks on your family’s faces when you walk out of the kitchen carrying a whole steaming pumpkin, the aromas of rosemary, sage, thyme, and melty cheese swirling about the room. When you serve this gorgeous squash-bound gratin, you simply stick a big spoon in the middle and stir, scraping out swathes of sweet, baked pumpkin as you serve. I don’t use the word often, but this dish is magnificent. Here we use Fontina and Gruyère, two old-school cheeses that can be found almost anywhere and are well known for both their gorgeous flavors and melting capabilities (fact: did you know that not all cheeses melt? More on this later, or in Basics chapter of Melt: the Art of Macaroni and Cheese). The cheeses are flexible here, though, so you can use whatever you’ve got on hand. You can use all Fontina, all Gruyère, or even use all cheddar cheese, Monterey Jack, Swiss cheese, or any combination thereof. I’ve made this dish with half Jarlsberg and half Monterey Jack, and it was incredible. Garrett once made it with aged cheddar – whatever they had handy at Trader Joe’s – along with chorizo and chipotle pepper. It was a show-stopper. Our goal was to create a silky, stringy macaroni and cheese gratin, baked in a pumpkin, making for an epic cheese experience with a little something special. This is our Thanksgiving gift to you. We hope you enjoy it. Happy Thanksgiving, everyone. I’m so incredibly grateful for you, my readers. Thank you for being a part of my journey. This recipe, baked inside the pumpkin—a trick inspired by Dorie Greenspan and Ruth Reichl, both famous for their stuffed-pumpkin recipes (among other things)—simply knocked our socks off with flavor and a stylish yet homey presentation. Here we use Fontina and Gruyère, two old-school cheeses that can be found almost anywhere and are well known for both their gorgeous flavors and melting capabilities. The cheeses are flexible here, though, so you can use whatever you've got on hand. You can use all Fontina, all Gruyère, or even use all cheddar cheese, Monterey Jack, Swiss cheese, or any combination thereof. I've made this dish with half Jarlsberg and half Monterey Jack, and it was incredible. Garrett once made it with aged cheddar - whatever they had handy at Trader Joe's - along with chorizo and chipotle pepper. It was a show-stopper. To prepare the macaroni the day before: shred your cheese, cook your pasta and sausage, then combine and stash in a sealed container in the refrigerator. A few hours before showtime, pre-bake your pumpkin, drop in the macaroni, and finish the dish in the oven while the turkey is resting. Preheat the oven to 350°F (176°C). Cut a circle from the top of the pumpkin at a 45-degree angle, the way you would cut open a pumpkin to make a jack-o’-lantern, and set aside. In a bowl, toss together the Fontina, Gruyère, sausage, pasta, scallions, and herbs. Once the pumpkin is done baking, take it out of the oven and fill it with the macaroni and cheese. Pour the cream over the filling. Place the top back on the pumpkin and bake for 1 hour, taking the top off for the last 15 minutes so the cheese on top of the filling can properly brown. If the top cream still seems a bit too wobbly and liquid, give it another 10 minutes in the oven. The cream may bubble over a bit, which is fine. If the pumpkin splits while baking, as occasionally happens, be thankful you set it in a rimmed baking dish and continue to bake as normal. Wine pairings: white Rhône Valley blends, Viognier, oaky Chardonnay, champagne. Additional pairings for the cheese: apples, toasted walnuts, toasted hazelnuts.